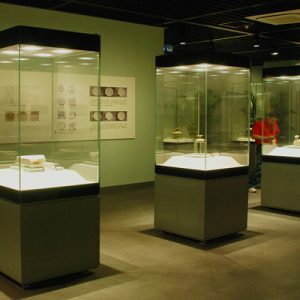 To stand on the floor independently,freestanding display cases with 4 glass sides and glass top for full vision exhibition.Full-view clear display space constructed by 5 glass sides to be secured to lower steel plinth to acquire robust support.External lighting can be effectively applied for illuminating display space.Freestanding display case with top light chamber is ideal to showcase artifacts from 4 or even 5 directions, being applicable to the exhibition of small,medium and also larger artifacts. Display cases with 5 glass sides stand alone on the floor with no additional support,with showcase sizes to be customized. Usually 5 glass sides of glass front/back/left/right/top for all-direction exhibition with no any vision obstruction. 90° hinged opening or pull & slide opening or lift-up opening for access into display space. Motor-driven and wireless remote-control system for options.